Cleaning items around your home or business can be easy. When you notice something is dusty, you can dust it. When you notice that something is dirty, you can wipe it. The exterior of your home is a little more difficult. Dirt, discolouration, algae or mould all grind themselves into the nooks and crannies around your property. These cannot be washed away as easily as you might think – that is where our Gorillas come in! Our Chilliwack pressure washing gets your property looking like new. The most important part of our pressure washing service is, not only expert results, but protecting your property as well. In the wrong hands, a power washer can be a dangerous machine. That much pressure can strip paint , damage materials and even break skin. That is why it is better to have a professional handling our Chilliwack pressure washing. Pressure washing is not right for every property type. Using pressure washers on certain types of vinyl siding can not only damage the materials, but can trap water, paving the way for mould in between layers of exterior materials. It is better to consult a professional before attempting any type of pressure washing. Staining and build-up are easy to acquire but hard to get off. Even with pressurized treatment techniques, dirt and grime can hold on. 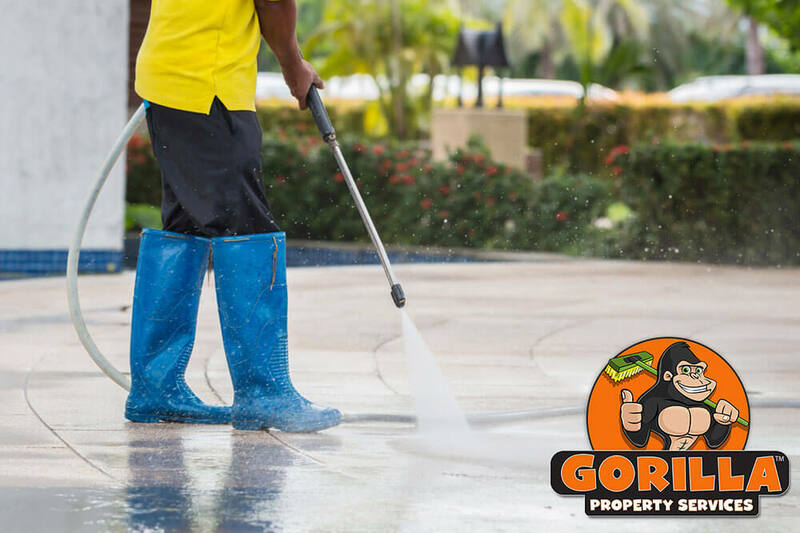 That is why our Gorillas have their own specialized methods to remove all those things that are dragging your property down. The first step to Chilliwack pressure washing is cleaning away build-up on surface layers. Gorilla technicians accomplish this with an application of our eco-friendly cleansing and disinfecting agents. Once our specialized cleaning solutions have had a chance to get working, we use soft-bristled brushes to dislodge any remaining dirt across surfaces. With all of that sitting dirt out of the way, we have a clear view of the surface underneath. That is when our pressure washers can get to work!